Are your messages to parents being read? Are your parents confident that your teachers truly understand their child? Are your teachers having to use multiple channels to connect with parents, making communications hard to manage? At the same time, are your parents busy, hard to reach, and yet wanting to know more and more about their child’s early education? Early education services are adding photo-sharing, Facebook and other channels in response, but each has its drawbacks. And together, they are taking up more and more staff time. In short, communications are a growing headache. Using a dedicated, secure online platform, you can upload child and staff profiles and then invite parents and extended family. Staff can send photo, video and plain text messages to everyone, to a group or to a parent. Access Educa by computer, iPad or phone — teachers mainly use computers, families mainly use the Educa Touch app on their phones. More about how Educa works here. 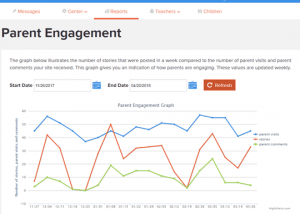 There are a number of so-called parent engagement software options for early education these days. Educa is not photo sharing. Our point of difference is that almost everything in Educa is one click away from an educational purpose. It was developed in New Zealand, designed to make it easy and intuitive to connect every observation shared with parents to a learning outcome, plan or milestone. This educational context is intertwined into the stories and notes that teachers share, fun photos and videos, but learning context also. This combination engages parents, draws them into the learning leading to helpful feedback and collaboration, extending the learning. Having one easy-to-use communication channel creates program consistency, saves staff time and simplifies teacher lives. By sharing learning connected to plans or curriculum or learning goals (uploaded into the Educa software), teachers can educate parents on their approach. In addition, teachers will receive some parent recognition. Parents appreciate the updates and will say so. Communication of news, announcements, sending of forms, all happens in one place. Parents also have access to forms, important documents, anything you’d like to share, replacing the need for paper. If there is an emergency, parents will respond to a message via their Educa app, whereas they may only look at emails in the evening. Finally, directors can see activity reports. If a parent is not active — perhaps it’s worth a call. They can track family engagement as a whole — if they try something new, they can check the engagement reports to see if it worked. They can also see all teacher interactions, which helps their management. Parents love that the news is instant, real-time. If the school had a visitor that day, they hear about it then, not at a parent conference when it is too late to discuss with their child. Parents can share their channel with extended family — we have aunts, uncles, grandparents in 85 countries. Learning specialists can also be added, if the parent desires. Educa is a two-way platform. Parents can contribute stories and photos also, right from the preschool app. All communications become part of the child’s record. This is what young parents, digital natives, expect — to interact in a secure and private channel. If you are a parent, click here to tell them about Educa. Educa has security and sharing settings with child privacy in mind. Its teacher approval and oversight settings improve the consistency of outgoing communications and its easy-to-use interface suits teachers. Load any curriculum or learning guidelines into Educa and connect activities or individual observations to that curriculum. If your school records child observations through the year, Educa is a powerful tool. Parents appreciate the shared learning – it brings families and teachers together to grow the learning. The online records are easily accessible and transferable.